New York, June 15th, 2016 — Witbe, the leader in Quality of Experience (QoE) Test and Monitoring, announced today the opening of a new Witbe Center, in Denver, CO. By being closer to its clients — major Broadcasters and Operators in the area— Witbe will be able to better address their operational, commercial and technical needs. Following its successful stock market introduction last April, this opening is the next stepping-stone in Witbe’s North American development strategy. As the second implantation in the US, Witbe’s Offices in Denver will fully manage the West and Central Areas’ operations and developments. Closer to its customers’ headquarters—Charter TWC, DirectTV, Dish, Echostar, Comcast, Century Link—, Witbe is developing a quick reaction force, capable of regular maintenance and rapid response to potential situations. In order to do so, Witbe has taken no short cuts: sales consultants, sales engineers and technical account managers were hired for this opening. Moreover, this strategic location will not only shorten the Robots delivery and set-up processes for Witbe’s clients; it will make it easier for onsite demonstration and nearby staff training. These new Witbe Offices are in line with its dynamic double-digit growth in the North-American market. Six years after its first office opening in New York and three months after its IPO on Alternext, Witbe has already gained recognition from major Broadcasters and Operators. Witbe’s Offices in Denver will thus help leverage this unique clients portfolio. Furthermore, Colorado and particularly the Denver-Boulder area, is emerging as a new hub of Innovation and Entrepreneurial activity: Witbe’s Offices in Denver Center are definitely at the right place, at the right time. 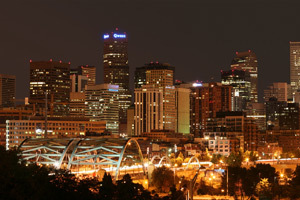 « We are very excited about the opening of our new location in Denver. Beware; we are not just talking about a sales office. Denver will be a true new center for Witbe with a complete team on board. More than a mirror of our NY offices, it will reinforce Witbe’s growth on the US Market. With our recent IPO and this major strategic investment to strengthen the deployment of our offer in the US, Witbe has never had such a conquering spirit », as mentioned by Marie-Véronique Lacaze, Co-Founder – President & Chief Executive Officer of Witbe. Since 2000, Witbe offers an award winning approach to ensure the Quality of Experience actually being delivered to the end-users of any interactive service (telephony, video, Web, etc), on any device (PC, smartphone, set-top box, etc), and over any type of network (fixed, mobile, OTT, etc). Leading innovations in the QoE industry, Witbe technologies have already been adopted by over 300 clients in 45 countries. National telecoms operators, cable operators, broadcasters, video content providers, set-top boxes manufacturers and iOS/Android apps developers, all rely on Witbe’s measurements. Witbe has offices in Paris, New York, Denver, Montréal, and Singapore. Previous post Witbe at AngaCom 2016 – Booth #L35 Next post Welcome, Netflix. Seriously.